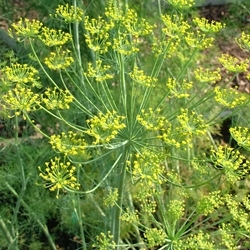 Dill's edible seeds and greens flavor many foods. Popular addition to sauces and a must for making pickles. Sold in a 2x3 inch cell. All plants are certified organic. Select here for transplant information, pick up and order dates. Slower bolting variety with uniform, high yields of foliage.